This is another painting my March 2010 cruise to the Bahamas yielded. I've been thinking about this one for a while, and finally decided it was time to give it a try. 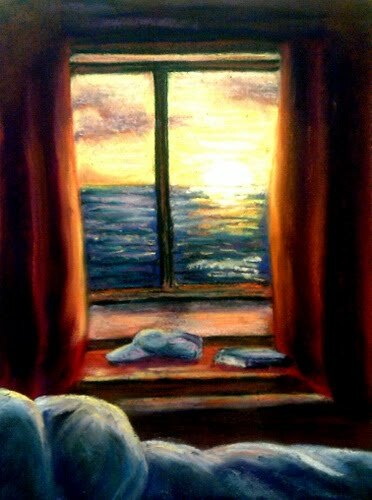 I always woke up very early on the ship when we were at sea. Our cabin was on the starboard side of the ship, so we faced away from the sunrise on the way to the Bahamas. I had to get up early and get dressed and go up to the Sun Deck to watch the sunrise then. But on the way back to port in Jacksonville we faced east, and I woke up early in the morning and captured the sunrise right from our cabin. I'm so glad I sprang the extra $50 or so to get an exterior cabin with a window. Not only did I enjoy the view, but I got a painting out of it too, LOL.